Mexico is a country recognized for its impressive colorfulness as well as its dramatic variety of flavors! Countless are the traditional recipes that every region of our exuberant territory has to offer to the world, and among them there is one whose reputation has extended its reputation beyond our borders, as one of the most exquisite delights of the sea born on our Pacific Coast: zarandeado fish! Some insist that the original recipe of the zarandeado fish comes from the Island of Mexcaltitlán, located in the state of Nayarit, and wich is presently promoted as part of the Riviera Nayarit tourist destination. For many, this island id the place where “Mexicanness” originated, a topic that we will deal with more detail on another occasion. Zarandeado fish is considered a Nahuatl delicacy which is prepared using pargo (of the snapper family) preferably as it has little fat in its skin, thus allowing for its white meat to remain juicy without drying out when in contact with direct heat as it is smoked and cooked with firewood that was –originally- mangrove. 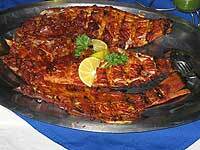 Another fish that is used often ―especially along the coasts of Jalisco― is red snapper (huachinango). Nowadays, other woods are used as well, such as guamúchil and oak, which affect the flavor differently. Zarandear means to shake in Spanish. This shaking implies moving, waving or rolling over constantly, which is precisely how the fish is cooked, after having been partially split in half and placed in a smoker that must be turned over constantly so that the heat of the burnt firewood cooks the fish. The cooking is slow and its perfection depends on the cook in charge of “shaking” the fish. The basic preparation consists of a fish weighing approximately 2 kilos (4.5 lbs. ), cleaned (deboned) and split in half lengthwise, including the head. A sauce is brushed on: butter, garlic, tomato, salt and pepper to taste, as well as other ingredients that you may want to add, since the final flavor depends on them. 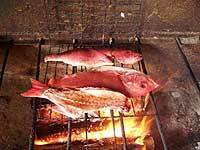 Once prepared, the fish is placed on the grill or smoker, thus exposed to the heat of the firewood. It should be flipped over constantly for approximately 25 or 35 minutes to cook it evenly throughout. To serve, the fish should be placed on a large platter lined with banana leaves (if available), decorated with thin slices of white or purple onion, as well as cucumber, orange and lemon slices. Freshly-made tortillas (preferably) and hot green or red sauce are a must. The dish can be complemented with white cooked rice, refried beans, carrots and broccoli, salad and/or avocado. At present, this dish is already considered as “of the house” and is commonly found on the menus of restaurants specializing in seafood. In Puerto Vallarta, the Rio Grande restaurant was the first to introduce it to our gastronomy in 1984, and thanks to the recipe of the sauce used to bathe the fish, created by Mrs. Graciela Peña (owner of the Rio Grande), it continues to be one of the favorite and most prestigious places to delight in this traditional recipe that, with time, has been adopted in more regions of Mexico. At the Rio Grande restaurant located at 1175 Mexico Ave., you will enjoy a familiar ambience, with personalized attention and warm service. Owner Arturo Hernández, pioneering businessman and restaurateur in Puerto Vallarta, is always waiting to give you a hearty welcome and introduce you to his “pescado sarandeado” which, because it is the specialty of the house due to its unique sauce recipe, is spelled with an “s”.